Exchange wide breadth indicators: how good are they? I have a wide range of broad market breadth indictors from Pinnacle Data Corp and here I’ll describe them and elaborate on previous blogs on which have the best track record. For example, the number of advancing stocks on the NASDAQ each day is given, along with the number of declining stocks. It is difficult to make sense of data in this form, it varies hugely each day. Instead, we plot cumulative breadth indicators. Each day, calculate the number of advancing stocks minus the number of declining stocks and add this to the running total, giving one data series to plot. Confirmation of the health of an advance comes if new index highs are matched by a new cumulative breadth indicator high. Divergence comes when new index highs are not matched by new breadth indicator highs. 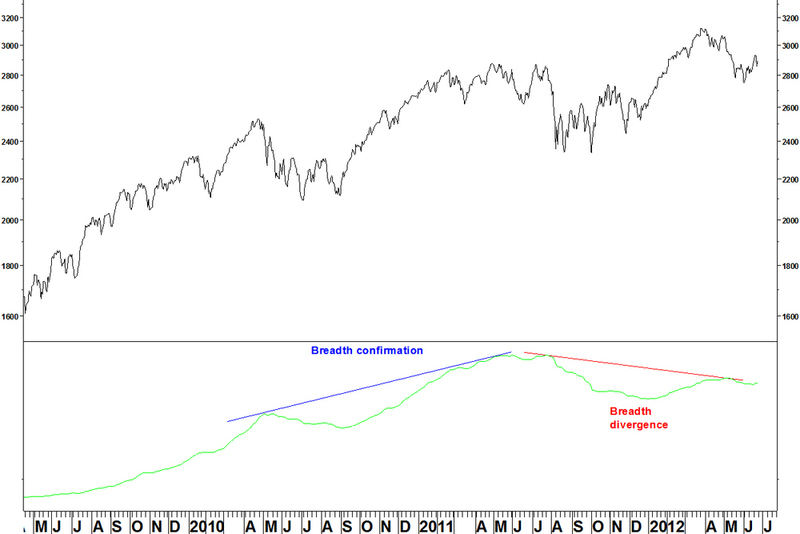 The major criteria are whether divergences are shown at the 1973, 2000 and 2007 highs. Other points of interest are in 1968, 1987, 1990. Here are the current situations of cumulative breadth indicators, where the track record suggests it is worth noting. These compare the latest index peaks (in March 2012) and the cumulative breadth indicator with their levels at the previous market peak in April 2011. Why is the NYSE breadth data positive, actually showing breadth moving ahead of price, whilst the NASDAQ and AMEX breadth data (highs minus lows) shows divergences? ‘..more than half the issues traded on the New York Stock Exchange are interest rate sensitive, which even includes preferred stocks and closed-end bond funds. Because their inclusion can sometimes distort the NYSE breadth data…’. So bond funds, which have been rallying due to falling interest rates since mid 2011 (the last breadth indicator high) are helping the NYSE breadth data stay positive. Meanwhile, the NASDAQ and AMEX breadth measures worth looking at show divergences. Ideally, the NYSE breadth measures would confirm the NASDAQ and AMEX measures, as was the case at the 2007 high but we don’t have that here. Given the bond fund action of the last year, I would pay more attention to the NASDAQ High/ low line than the NYSE breadth measures, even though the NYSE measures also have a good track record. The breadth divergence on the NASDAQ Highs – lows line is in place and serves as a warning of a possible market top developing. It does not however give the timing of when the market might break down. I’ll continue later by looking at other breadth data provided by Pinnacle: weekly breadth data and breadth data broken down by market capitalisation size. « Weekly breadth data: how does it differ and what does it tell us?